How I Made 26 Cards from 1 Sheet of Paper! 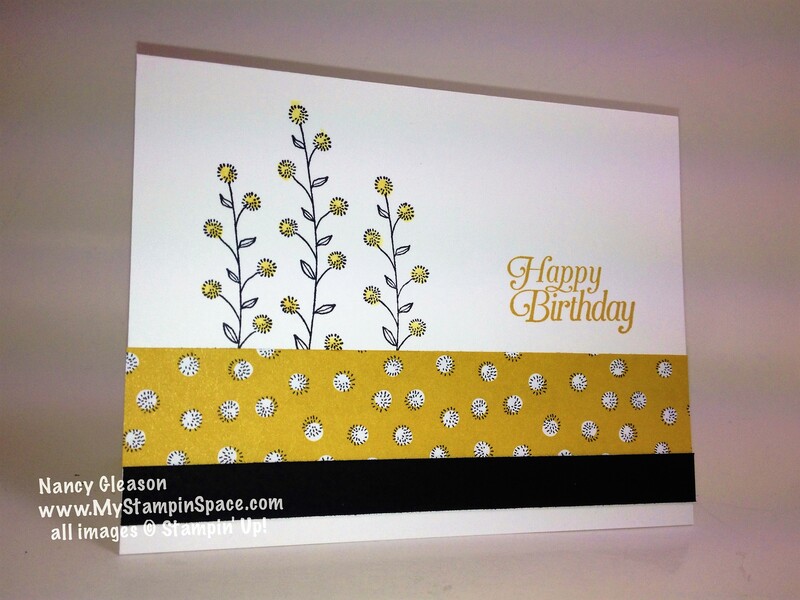 I recently got my pre-order in, and with lots of new stamp sets, and new DSP, I had lots to choose from when I set down to make some birthday cards. 44 Birthday Cards to be exact. Yup, that’s right! 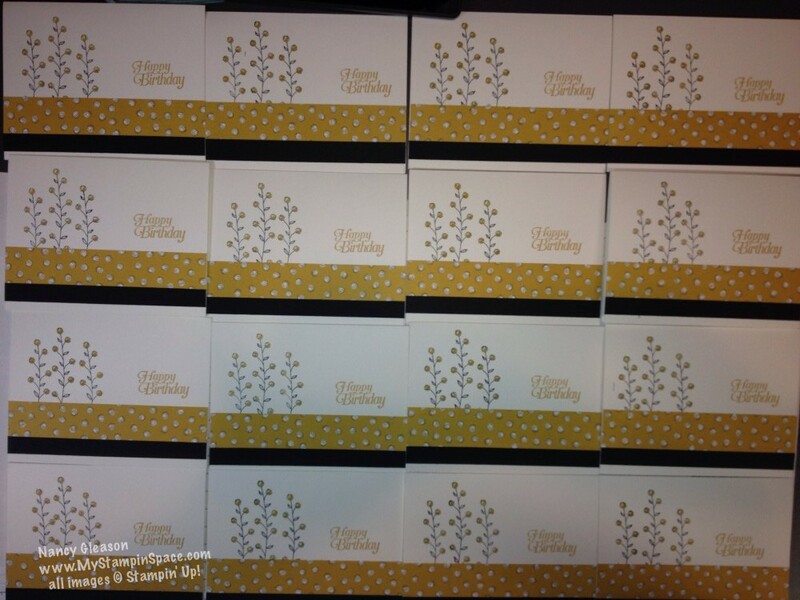 The girls from my Stamp Club wanted to do a Card Swap where we would each make 44 of the same card and swap with each other, so we would each go home with 4 sets of 11 cards. We divied up the occasions so each set would have birthday, get well, sympathy, baby, etc. So I need to make 44 of the same birthday card and I wanted to use my new papers & stamps. But since I have limited amount of paper to play with; I had to make what I had stretch. I used a 1″ x 5-1/2″ strip of DSP, which is how I was able to get so many out of one sheet of paper. The paper is Wildflower Fields DSP which I got FREE from the Sale-A-Bration catalog. 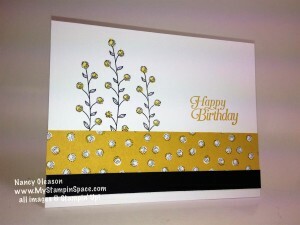 The flower is from a set of 7 stamps called Flowering Fields, another freebie from the S-A-B. I love Sale-A-Bration! No wonder it’s the most anticipated sale of the year! I can’t show all of the 26 cards at once because I don’t have enough room to spread them all out! So How did I do it? My trick: I cut a 1″ strip off the 12″ x 12″ paper, leaving me with a 1″ x 12″ strip and an 11″ x 12″ piece. I cut the 1″ strip into 2 1″ x 5-1/2″ pieces. leaving my only scrap of 1″ x 1″. I cut the remaining 11″ x 12″ piece into 12 pcs. 1″ x 11″. 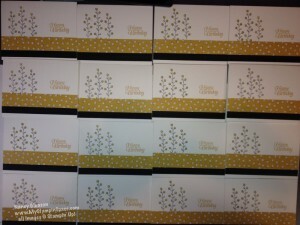 Then I cut each 11″ strip in half to create the 1″ x 5-1/2″ pieces. Well, this only about half my cards. I have one sheet of this paper left (there are 2 each of 6 patterns in a package). So I can either duplicate this and use up all of this pattern of paper, or make the others with another piece of paper. You’ll have to stop back to see which way I go! And next week I will be posting all of the cards that the ladies in my Stamp Club made for the Swap. I can’t wait to see all the goodness they’ve stamped up for us! I’m so blessed by being a part of the Stampin’ Up! family, and specifically the Stampin’ Pretty Pals under Mary Fish. I have met so many wonderful people thru this gig, and have developed personally in so many ways. My creative side has certainly flourished, along with my self-confidence. I’ve taught myself how to blog, and created this blog all by myself – an accomplishment I’m quite proud of! I’ve honed my skills with teaching, as I love sharing my passion for papercrafting and it has naturally evolved into teaching. Mostly, I love all of the people I’ve met along the way, and many more to come I’m sure. If you think you’d like to share in this, please consider joining Stampin’ UP! Many people join as wholesale customers – just for all the benefits: the discount, the opportunity to pre-order from new catalogs before they are made public, and the private chat groups with other demos around the country, and many more. You are under no obligation to ‘sell’ anything, host workshops or anything else. If you would like to learn more, email me and we’ll talk. If you’re ready to take the next step, order the starter kit here, it’s only $99 and you fill it with $125 of your choice of products.